If you are using the amazing Weebly service and love the simplicity of it all, you will be reluctant to move away from it even when you start to need more advanced functionality. One such hurdle is how to add another language to your Weebly website. Of course, you can just copy your entire site and cross link it to the original, but in that case you will need to maintain two separate sites. And things get even more complicated if you want to add more languages. Check out the comments on the video here. It already has over 200 Weebly users that have implemented it successfully and are using the procedure ever since. I understand that not everyone wants to mess around with HTML and CSS code themselves. It's one of the reasons why we're all using Weebly in the first place - for the simplicity by design! That's why I also offer my services to implement the whole procedure for you, so that you don't need to bother with HTML or CSS code at all. The prices for Basic and All-Inclusive packages are per additional language and there is no limit on the number of languages you may add. If you do need to add more than 3 languages, I would recommend on getting the Custom Package. Once you have placed your order, I will contact you on the email address or phone number that you have provided during checkout, to guide you throughout the procedure. The whole implementation is done within one day. If you have any questions, please feel free to contact me. For both Basic and All-Inclusive packages, you can also pay after the languages are implemented, and they come with a 30-Day Money-Back Guarantee after the payment. Some payments are handled through PayPal, but other payment options are available upon request. This website is not affiliated with Weebly. All credit goes to their respective owners. Hi! 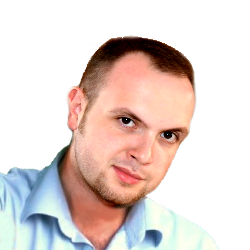 My name is Vladimir and I will be implementing the additional languages to your Weebly website. I will also be here to answer any questions you may have and guide you step-by-step through the procedure. As the person who discovered the multiple language procedure and helped over 200 users to implement it, you can rest assured that you are in good hands and you can rely on me to make your website shine in all the languages that you require.